All Thumbs Reviews: Smelly washer? Dead batteries? Giveaway. Smelly washer? Dead batteries? Giveaway. A couple of things that might make your life better. I tried, I tested, I tell. Got a smelly washer? I did. It's my one and only complaint with my front-loader. Leaving the washer door open between loads seems to help reduce mildew -- I live in a dry climate so this option is available to me. Another option is SmellyWasher, a 12 oz bottle of powder that is advertised to last for 24 treatments (2 years). I received a $15* bottle to try. I've used it twice -- one empty load a month -- and I do notice a slight difference (still leaving the door open). To use, you run an empty washer on the hottest setting for 2 minutes. Allow to soak overnight and then complete the cycle. What I don't like: doing empty loads, especially on the Hot setting. Doing so goes against my anti-waste nature. Also, the bottle tells me to visit the company's website for more information on keeping odor away. One of the tips? "Don't Close the Lid or Door." 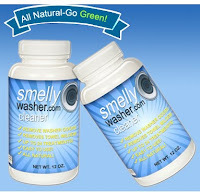 Smelly Washer is giving away a bottle to one All Thumbs Reviews reader. Just leave a comment below with the words, "Smelly Washer" by November 30 and we'll randomly draw a winner. SmellyWasher will send the product to the winner directly. Should you wish to buy some SmellyWasher, you can get a 10% discount by November 30 by entering this discount code: weebleswob. * $17 on the SmellyWasher website and $15 through Amazon. Want to save money and reduce the amount of toxic trash you produce? 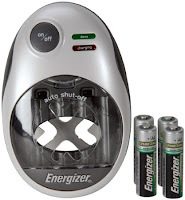 The Energizer Rechargeable Easy Charger charges up to four double-A or triple-A NiMH batteries simultaneously and lets you know when they are full. And if you are more Martha Stewart than I, you may be impressed with the changeable decorative coverplates (white, black, and silver). $19 through Amazon. Disclaimer: Both of these companies sent me a complimentary sample to try out. I haven't noticed my washer getting stinky...maybe because there aren't a lot of "in between load" times. Having three middle-school kids tends to keep my washer going from load to load to load (which keeps me going too). Anytime I say the words, "I got the laundry done," my husband says, "Is that really possible?" BTW, try using vinegar or running an empty load heavy on the bleach. That helps with the odor too. I just read about the front loading smell washer thing and was bummed because I dream of having front loaders. If there is a product that can help with that YAY! I can still get front loaders! I cannot however leave the door open because my cat thinks that's the place to pee when the dryer door is left ajar.